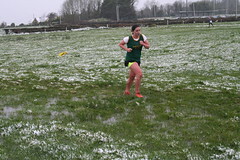 The final race of the cross country season took place in Dundalk IT on Sunday 3rd February. Moyne AC had 23 juvenile athletes entered on the day, however due to illness and traffic delays due to road collision, a few athletes sadly missed out on competing on the day. These athletes were Jack Gleeson, Denis Brolan and Shane Moloney. First up were the U/11 Girls running 1,000m. Alana Spillane ran a great race finishing in 11th place and earning herself a national individual bronze medal. Alana was followed home by Dearbhla Gleeson 70th, Ruth Phelan 73rd and Meabh Leahy 90th. The club finished 9th in the team competition with Alana, Dearbhla and Ruth on the Tipperary team that finished 7th. The U/11 Boys also ran 1,000m and were led home by Billy Gleeson in 44th position, with Jack Reddan 56th, Jim O’Neill 62nd, Rógan Lyons 65th and Bill Cussen 87th. The Boys finished 11th in the team competition with Billy and Jack members of the Tipperary team that finished 6th. Next up were U/13 Girls, running 1,500m with Amy Reddan finishing in 48th, Saoirse Doran 58th, Aisling O’Loughlin 72nd and Blathnaid Lloyd 90th. The club finished 11th overall with Amy and Saoirse on the Tipperary team that finished 5th. David Doyle led the U/13 boys home in an excellent 15th place, Jack Flanagan followed in 44th, Adam Phelan 51st, Frank Doyle 63rd and Paddy Cussen 71st. These boys finished just outside the medals for Tipperary in 4th place with the club team finishing in 6th. Mary & Tomás Cussen were our only competitors in the U/15 races, running 2,500m, Mary finished in 30th and Tomás finished 37th. Well done to all athletes for competing today!